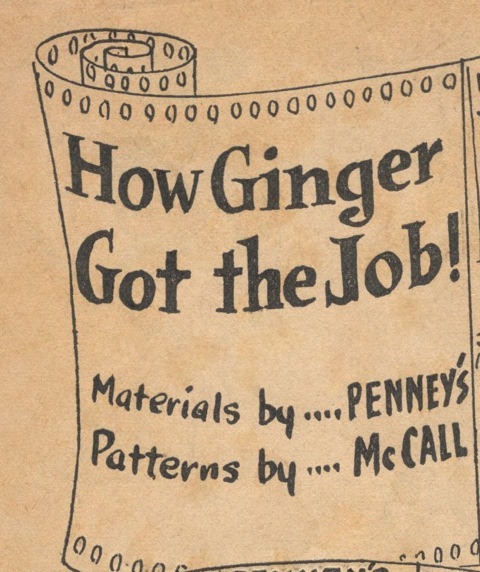 How Ginger Got the Job! I love how Ginger’s transformation involves not only a freshly sewn dress in a cute diagonal print, but also a new hat and a good hair day. Our heroine wins over her new, male boss with help from a girlfriend wise in the ways of properly un-dowdy femininity. Ginger’s new hat also points to how department stores like J.C. Penney’s could expect further sales connected to purchases from their sewing departments—accessories to match the customer’s soon-to-be-made new outfit. I’m also giving away a copy of the PDF to one lucky reader. To enter the giveaway, just leave a comment below by midnight (EDT) on Saturday, September 8th. The winner will be chosen at random and announced this Sunday, September 9th. It’s so true, and 1938/39 are my very favourite fashion years. This reminds me of a Simplicity educational video on YouTube that was made in the 1940’s! Same message: you can make smart clothes that change your life. I love this stuff, but I can never find it on my own as well as you do. I’d like to win this, too. What a great comic strip! I wish women were as crafty as they were back then – making a new garment rather than buying one for a special occasion. I also like how the women resorted to her brain and not her physical assets to get the job. That’s my kind of woman! Oh, and I’d love to enter the giveaway. Yes and yes! How quotable: “I never realized before how much confidence a smart outfit gives a girl.” That is so true – and timeless, too! Thanks so much for sharing this! Oh yes, please enter me in the giveaway! What a great little strip! The 30s is my favorite era. I love this! Thanks for the chance to win such a cool resource. A great fitting outfit can definitely change your mood! I cannot wait to start sewing a few business outfits for the office. Now if only I could find comfy shoes. 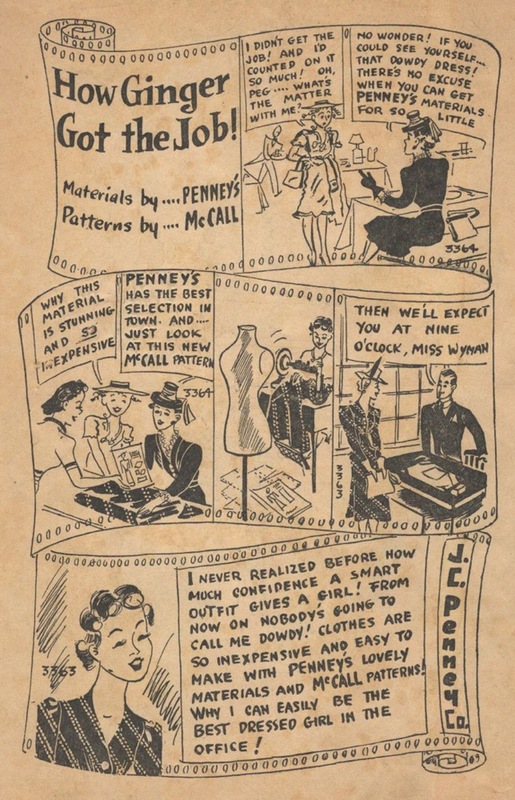 Love the strip, love 30s fashion, and love McCall’s patterns old and new. My home was built in 1938, and I’ve often day-dreamed about the stylish clothes that have been hung in the cedar-lined closets since then. 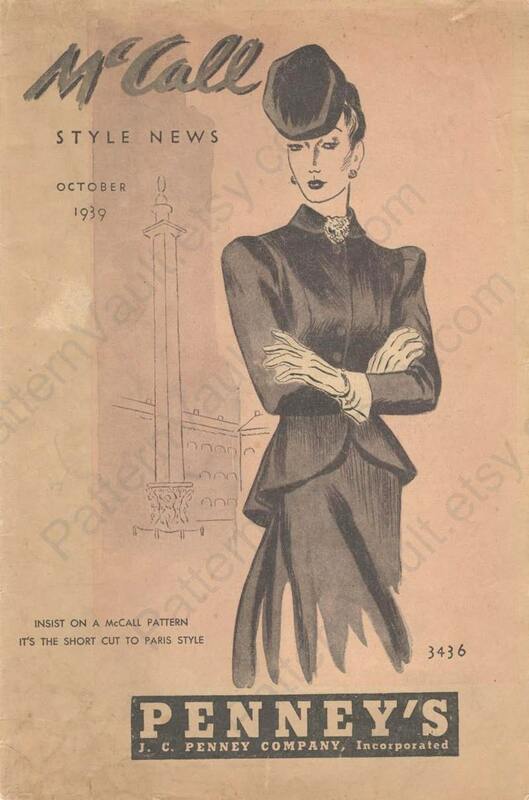 So glad to see the JC Penny’s ad and would love to win a PDF of the McCall’s Style news from 1939. I loved this–thank you for sharing it! And thanks for the chance to win such a fantastic giveaway! My boss and I would kill for this pamphlet! OMG, what a GREAt find! Why or why can’t I find things like this in my area? So glad for PDFs, this way I can enjoy the experience, too!! !